At the Neohumanist school, Zonnelicht, in Den Bosch, The Netherlands we have a three day Teacher Training course every year. This year the theme was: Philosophy in Action. We focused on Yama and Niyama, the Layers of the Mind and Brahma Chakra. Didi Ananda Bhadra and Didi Ananda Devapriya came from Sweden and Romania to support us. The new teachers had the opportunity to learn about the fundamental aspects of Neohumanist philosophy with Didi Ananda Devapriya. 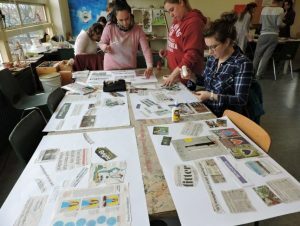 The more experienced teachers were involved in interactive workshops to deepen their understanding together. 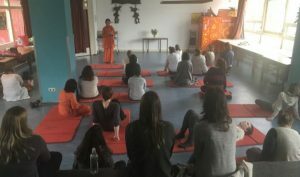 In addition to a variety of workshops, activities and presentations about the three philosophy subjects, there was also space to feel oneness through kiirtan, meditation and yoga practice and teachers had the opportunity to learn or review their personal meditation practices with the Didis. The first day of the training we started with kaoshiki, kiirtan and meditation, like we do every day in the training. It was the first time we used our new meditation room, and there was a good feeling right away. When the meditation was finished we went to the big hall to play a game about Yama Niyama. Each teacher received a paper with one of the Yama or Niyamas, and then had to demonstrate it to the others without words so that they could guess what was presented to them. After it was guessed, there was a conversation about how you could see or motivate this in yourself and others. This helped us to look at Yama Niyama in a creative way and connect to how you could see it in the world. This helped us to internalise the values in ourselves, so we could connect them in practical ways to our daily work, which we discussed in the afternoon. In the afternoon program we related this to different ages and split up in three different groups. The first group was the baby-group, from 0-2 years old. The second group was the toddler group, from 2-4 years old. The last group was the afterschool program, from 4-8 and 8-12 years old. 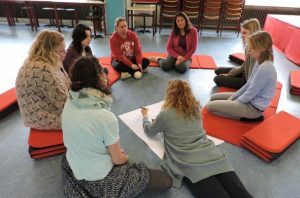 We reflected together about the ways we already have incorporated Yama Niyama in practice and how we could further stimulate this as teachers for the children. From these in depth conversations came some beautiful plans, like a new development program for the afterschool program, so the children will be provided with chances to develop Yama Niyama in themselves. This first day was ended with the film: ‘The beginning of life’. This was a wonderful and inspiring movie where we could see Yama Niyama in neuroscience. The film tells us how we are formed by our genetics, combined with our relationship with everything around us. The Beginning of Life investigates what separates us and what is essential to all of us, how we can create a better society by investing in the first years of children’s lives. The second day was all about the Layers of the Mind. We introduced this theme with games again. The first game we played was hide and seek. All the teachers chose a layer and then hid. When they were be found they had to express their layer at a certain age to the seeker, who had to guess it. The seeker had his mission fulfilled when all the layers were found and the age where the level of consciousness was guessed correctly. In this way our understanding about the layers of the mind was enlarged. The importance of the sensorial quality for teachers was clear when we discovered that one of the teachers was still hiding. When we all gathered again for a cup of tea she came out of her hiding place after twenty minutes with a frown on her face saying, ‘You didn’t look for me!’ So we learned to use all our senses when playing hide and seek with the children. When the game was finished we talked about what teacher qualities we need to be able to provide the children with the best opportunities to develop the Layers of the Mind with the children. A lot of teachers became aware of their qualities, but also of the things we need to develop in ourselves. In the afternoon program we split up into the three age-groups again to have an in-depth conversation about daily practice. At the baby group we talked about the needs of baby’s in all the different stages of their development. We talked about the opportunities we need to create so we can help the babies to develop their full potential. This day ended with a dance workshop and a music workshop. In the dance workshop we discovered our physical boundaries and tried to see if we can push ourselves to feel more free to express ourselves using the whole body. In the music workshop we discovered our internal rhythm and discovered our vocal powers. The theme of the last day was the Brahmacakra. We began the day watching a film on the “Brahmacakra”, seeing life as a journey of evolving consciousness, and our role as teachers in facilitating this evolution. We then continued with a discussion about ‘What do we wish for the world’. It was then that all of the three subjects that were presented in this course came together. The philosophy classes developed our awareness of the importance of our personal development as a teacher and our awareness of the personal development of the children. In the concluding session, we focused on the society. We started this session with a song we listened to while we visualised what we could contribute to society. 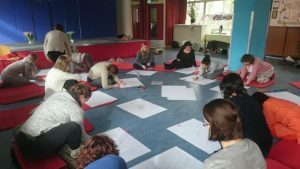 The song was by a Dutch singer and rapper about discovering your personal power to help the world, After this visualisation we used our intuition to make a creative expression about our personal idea. Everyone made a poster with this wish, all in our own way; colours, words, drawings, pictures, songs. A lot of teachers expressed that they were able to connect to their purpose in life, because of this opportunity to reflect on our work in a broader way. It helped everyone to feel part of a bigger mission. Sharing this with each other was very inspiring, as well as looking at the opportunities that life brings. We also listened to the obstacles every teacher personally had in this moment of life that held them back from fully committing to these dreams. The limitations were written down on paper and then we went outside and made a big fire to burn them all. It was as if we literally “burned our samskara’s” (accumulated reactions in potentiality). It sparked our altruism and hope to be able to do something for this world without any limitations. The 3-days training was very inspiring. 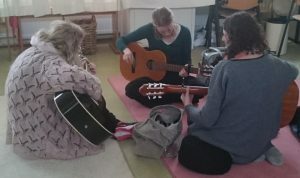 The theoretical deepening in the morning (day 1: Layers of the mind, day 2: Yama niyma, day 3: Brahmacakra) and the connection with practice in the afternoon. This facilitated the theory becoming clear immediately. 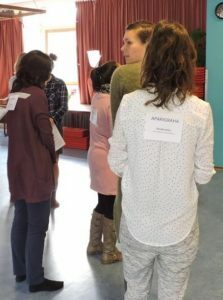 From the theory we looked at how to further deepen the program, how to better support both the group and the individual child and how to improve the communication towards the parents in relation to our vision. This has given me new insights that I have been able to apply in practice immediately in the week following the training. What impressed me the most however was the connection and bonding. After such a special, sometimes confronting but most of all instructive weekend, with lots of new insights, we have become one team again that wants to go forward. 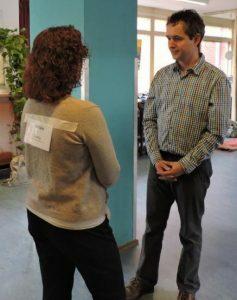 At first I didn’t know what to expect when I heard about the ‘three-day course’ at Zonnelicht. I remember looking at the schedule and being extremely confused. I saw terms I never heard before, like Didi, kiirtan, Brahmacakra, etc. 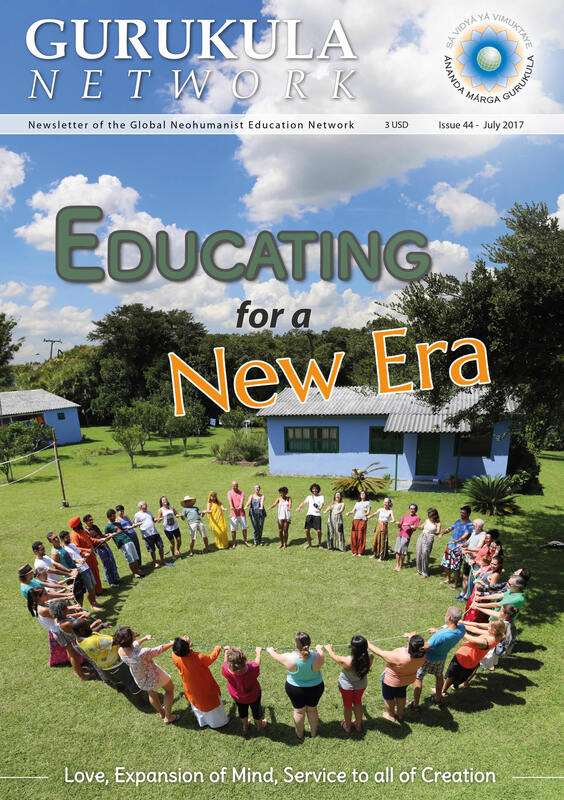 From the very first day the content of Neohumanist Education became clear to me and I really liked the fact that there was an excellent balance between theory and practice. Apart from the obvious fact that I learned a lot about NHE, I really loved the atmosphere during the course. You really could sense the inspiration and excitement that was going on! Both Didis were very nice and intelligent people. I really liked their effort in providing great quality and delivering information in a very understandable way. I also liked their positive energy and open-mindedness. During the course it became clear to me that it is very important to teach children to care for other human beings, animals and plants. In our Western society we are used to living our lives at full speed. It is very hard to find time to reflect and observe. We often don’t think about the things that really matter to us and everything around us. As a teacher at Zonnelicht, I find it very crucial that I pass on values like empathy and altruism to the next generations. Not only do we need to tell them, we also have to search for meaningful situations. During the course we (after-school teachers) decided to create an education program concerning Yama and Niyama; a prime example of inspiration leading to motivation to improve the way we educate our children. For all who are interested in the learning the philosophy and practice of Neohumanist Education, we kindly invite you to join the yearly Lotus Teachers Training. It is usually held in February. We welcome international guests!